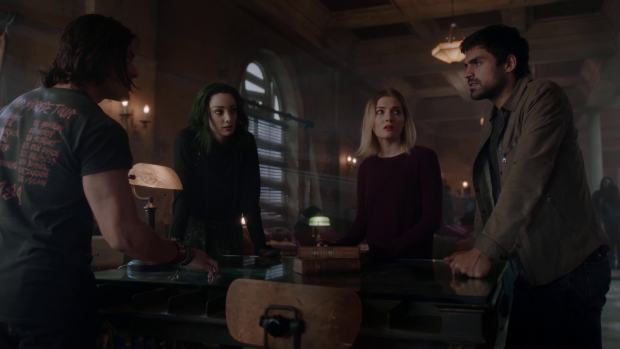 The Gifted wraps up for its winter hiatus with caged Mutants and extreme methods on both sides of the Mutant/Human conflict. Esme is the real star of the show this week in so many ways. I mentioned last week that she was likely manipulating the others to get the best outcome for herself and this was confirmed by her actions in this episode. It may be something that was obviously sign posted but that doesn’t make the storytelling bad especially when it makes sense for the character to behave this way. The introduction of Esme was very recent so there has been less time to get a sense of who she is than some of the other characters which does make her appearance feel more plot based than character based though she does factor into the overall plot of the season so far as well as the relationships of the characters in a very unique way. A big problem on this show has been repetitive arguments and I’m now convinced that the arguments between the characters go round in circles by design. The presence of Esme supports that as she doesn’t get involved in those arguments because everything she does is in service of her own goals. This doesn’t excuse the repetitive arguments but it’s fascinating to watch her personality subtly shift depending on her audience and how these small alterations almost always have her coming off as reasonable. The beauty of it is that the other characters are so caught up in their own drama that they don’t notice. Esme’s plan could be rumbled if the other characters took the chance to compare notes. 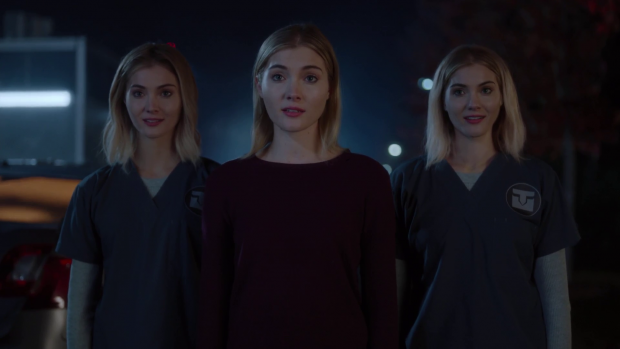 Skyler Samuels absolutely nails her performance throughout. In fairness the situation is rife for manipulation as there’s a lot at stake. Clarice, Sonia, Lauren and Andy have been captured and Lorna knows exactly what that means having experienced it themselves. There’s a difference of opinion on how to proceed which does play into the established character traits. Lorna for example wants to commit the Underground to an all-out assault which seems to be her go to for pretty much anything at this point. Reed and Caitlin think that Lorna’s plan would make the situation worse so there’s a division of opinion that makes it easy for Esme to manoeuvre. The other characters are represented and hover around the two sides of the argument. In essence we have a stripped down and less compelling version of the Xavier/Magneto debate that viewers of the films will be so familiar with. Both sides have similar outcomes in mind but the approaches are far different. I’ve praised this show before for handling the debate in a very different and interesting way but the handling of it in this episode didn’t work as the conviction wasn’t entirely believable. Lorna’s impulsive tendencies are well established as is her tendency towards violence but this has always been tempered by an outlook that is somewhat practical. Her bizarre training methods show that she is aware of how much danger Mutants are in and knows what needs to be done in the name of self preservation. An all out assault doesn’t match with that version of Lorna so in that respect her viewpoint comes across as impetuous. It can be excused to a degree considering the intensity of the situation and Lorna’s connection to her fellow mutants combined with her dislike/hatred for humanity but even at that her ideas feel at odds with who she is supposed to be as a character. Reed and Caitlin want to find a less violent solution and circle back to the idea of using legal means to improve the situation. Thanks to Esme’s interference this transitions into a plan to convince Jace to transfer the captured Mutants to a normal prison. 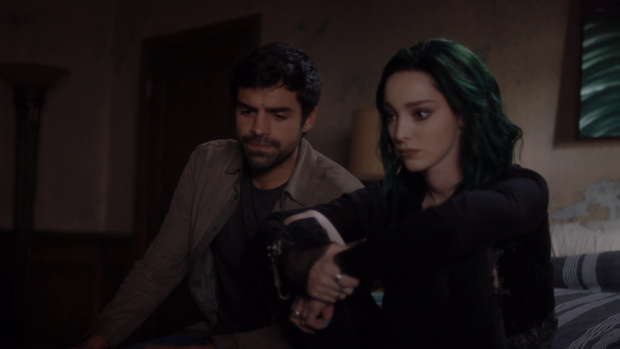 As plans go it isn’t a bad one since Reed has a pre-existing connection to Jace so has the best chance of making him change his mind. 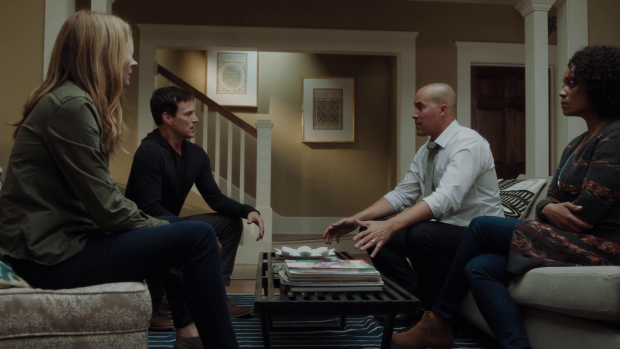 The conversation between Reed and Caitlin have with Jace and his wife is very strong because it is very much a discussion had between parents. Reed and Caitlin appeal to their parental instincts in order to establish a rapport to inform the discussion. It may be a little devious considering that Jace and Paula lost their daughter but it’s a believably desperate act made by desperate people. Disregarding the fact that their children are Mutants the base fact is that Reed and Caitlin have lost their children and that’s a fear that anyone as a parent can relate to. Ultimately Jace is sympathetic but won’t budge on his outlook but Paula will and that becomes the key. This is coupled wiith Jace talking to Sonia about how much he resents her personally because she is responsible for him losing the memory of the last few days of his daughter’s life. It isn’t established why she can’t simply give them back to him but I’m glad to see this thread picked up again even if it is manipulative and only in service of the Strucker story but it can’t be denied that the sorrow can be felt in Coby Bell’s delivery. Sonia is also sympathetic and tells him that it was an accident but it’s clear that this is no comfort and only supports his reasoning for believing Mutants are dangerous. Naturally the prisoner exchange ends up going ahead and Esme makes her move in a really big way. Watching her mind control everyone in range and making them brutally kill each other as well as themselves was distressing. It shows how well executed her manipulation was and gives us an idea of the full extent of her abilities. The problem with it is that I couldn’t help but wonder why she didn’t do that earlier rather than the more subtle manipulation technique she went with. There could be some limitations to her powers that we haven’t been made aware of at this point but for the purposes of this episode it’s a significant hole in the story. It’s also possible that she simply enjoys being manipulative which might be interesting to see explored as a justification but it’s not something the episode gives to us either. The reveal of her two sisters and the way they talk in unison is appropriately creepy setting her up as a powerful and complex antagonist. I like that she plays both sides without stating any particular alignment suggesting that she will be a common threat for both the Underground and Sentinel Services/Trask. Lauren and Andy’s predicament in this episode was also very strong. Dr. Campbell (Garrett Dillahunt) knows all about their abilities and is interested in them from a scientific point of view. He’s a really cold and detached character who clearly sees them as nothing more than specimens to be studied. It’s completely dehumanising but that’s very much the point. His extreme methods are played without any degree of malice attached to them which makes him even more unsettling. 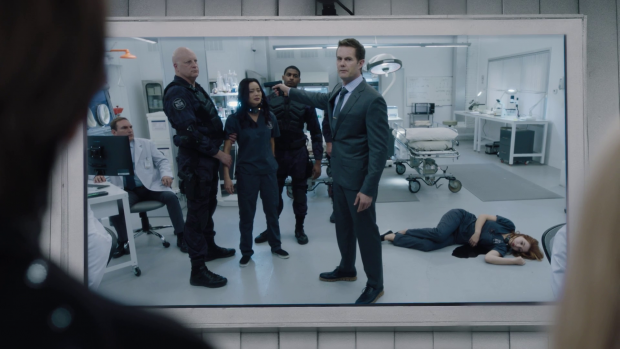 Casually killing Sonia is a great example of not seeing Mutants as being people because the approach taken is that her death will be the necessary motivation to get Lauren and Andy to consent to the experiment. Sonia’s death is shocking because it isn’t telegraphed in any way and her loss will be felt to a significant degree regardless of how audiences might respond to the character. She has been around since early in the season, involved in much of the main plotting and has extensive ties to the rest of the cast. John will certainly mourn her passing and the show will be different as a result. Contrasting that with the fact that Dr. Campbell doesn’t care also enhances the anti-Mutant sentiment that serves as a running theme. Garrett Dillahunt is mesmerising in this role. His performance is constantly cold and detached showing a strong resolve and complete commitment to scientific discovery no matter the cost. His dispassionate delivery when it comes to offering the ultimatum to Andy and Lauren is really eerie but there’s enough emotion in his voice and facial expressions when it comes to the science. Lauren and Andy are shown to be somewhat graceful under pressure though they do crack when realising how serious Dr. Campbell is. Lauren is the voice of resistance where Andy is the one who starts to buckle early on. As a duo they compliment each other well as Lauren is the one to inspire strength and courage where Andy takes inspiration from it. Once it becomes clear that people will die if they don’t cooperate they are forced to use their powers which are enough to dent an adamantium cell showing how much destructive potential Lauren and Andy have as a pairing. The episode does assume some knowledge of X-Men lore when mentioning adamantium and there is a ham fisted reference to X2 when Dr. Campbell mentions where it came from for no practical reason but the impact of their collective strength comes through clearly. The use of their powers does raise some problems for this particular scenario. For example there was no clear reason why they couldn’t use their powers to take out the collars and then attempt to take on whatever forces came their way. It’s possible that they aren’t able to refine them quite yet but there’s nothing said about their level of control either way so I would assume an attempt could at least be made even if it happens to be unsuccessful. This show is weirdly inconsistent with using common sense in regard to Mutant powers. A solid and exciting midseason finale that has some problems. 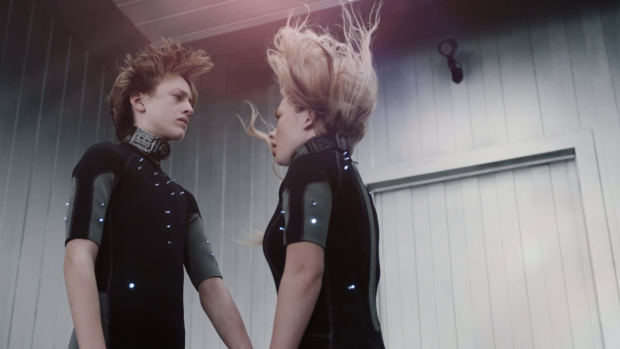 The real standout character was Esme who showed an ability to manipulate people into doing what she wants them to do without even using her mind control abilities. She pushes people ever so slightly down a path they’re already on with a few choice phrases. It’s fascinating to watch especially since the other characters are too mired in repetitive arguments to notice. This doesn’t excuse the repetitive arguments but it’s good that they are being addressed as something that is knowingly happened and can be exploited. The pay-off when Esme brutally forces people to kill each other and themselves to save her sisters was really effective and nicely sets her up as an antagonist for everyone who has no specific side. Reed and Caitlin appealing to Jace and Paula as parents was a nice touch as it’s a very personal and relatable position for them to take. Coupling that with the reminder that Jace has been forced to go through the raw feelings of loss where his daughter is concerned is also a good idea. The death of Sonia is a shock that will resonate with many of the characters as well as establishing Dr. Campbell as a serious threat. His dehumanising attitude towards Mutants and dispassionate delivery are really eerie to watch. Andy and Lauren trying to withstand the pressure placed on them with Lauren being the source of strength makes them a compelling pairing and the point where they are forced to use their collective ability feels earned though comes with some logic issues concerning how the choose to use it. In general the show suffers from inconsistencies in how abilities are used.